Our series on the native trees of Chicago is back this week as we take a closer look at a tree that is beautiful and loved throughout the Chicagoland area, the elm tree. Elm trees are very hardy trees that can withstand tough conditions and they are valued for their shape, shade, and natural beauty as ornamental trees. Elms, especially American elms, were very popular trees to plant in cities like Chicago that grew and developed in the 19th century. Because of their durability, elm trees can be found in yards, parks, and along streets and walkways. There are around 30 known species of elm found throughout Asia, Europe, and North America, six of these species are native to the U.S. While elm trees have long been a favorite among Chicago locals, their population has been drastically affected by Dutch elm disease and the elm leaf beetle. Dutch elm disease was introduced in the U.S. in the 20th century and it killed many elm trees in a very short period of time. Most of the elm species native to the U.S. are highly susceptible to Dutch elm disease. Unfortunately, experts do not recommend planting American elm trees, an old favorite, because of how susceptible they are to the disease. However, all is not lost as cultivars and hybrids of elm trees have been discovered that are much more resistant to Dutch elm disease and safe to plant. In this guide, we will delve into the characteristics of elm trees and the different species of elm native to the U.S. and discuss the effects pests and diseases have on these trees. If you have elm trees on your property and you want to ensure that they receive proper care, call our arborists at Hendricksen Tree Care. We are ISA certified arborists that have long been providing tree care services for all types of trees in the north and northwest Chicago suburbs. Our arborists can provide care for insects and diseases, maintenance, and tree trimming services. Elm trees are large deciduous trees that range from 30 to 50 feet in height. 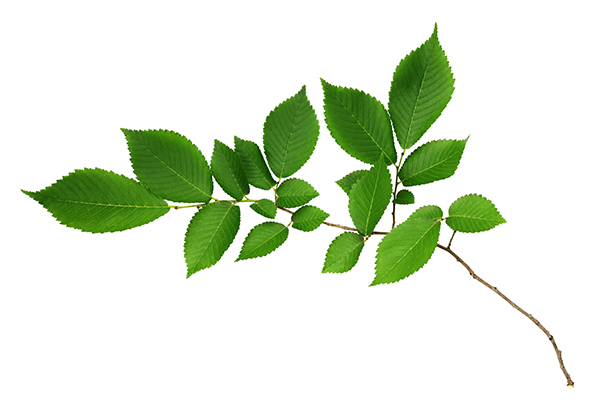 The leaves of an elm grow alternate and they are oval shaped with a pointed end and serrated edge. Most elms have small white or purple flowers that grow in bunches, but that are not particularly showy or fragrant. The elm has long been loved for its big expansive canopy that turns to a goldish yellow color in the fall. 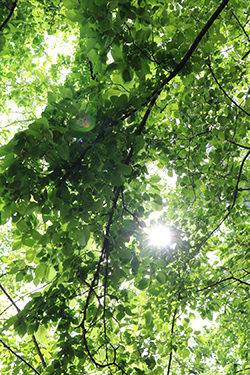 Height: Elm trees are tall trees with expansive canopies which is why they have been valued as a shade tree. 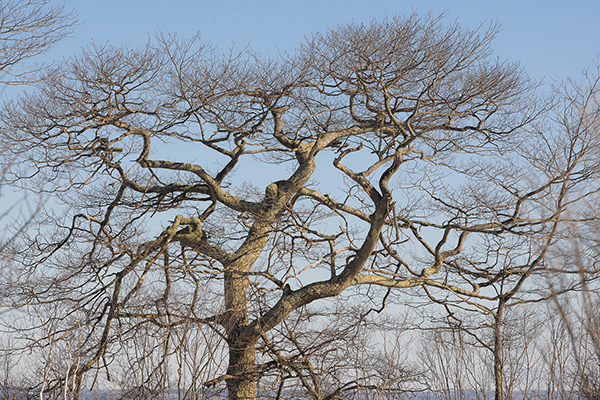 Elms can grow between 30 and 60 feet tall and 20 to 40 feet wide. Leaves: As mentioned above, the leaves of most elms are oval shaped and grow in an alternate pattern. They are serrated on both edges and the leaf is typically shorter on one side of the center vein. 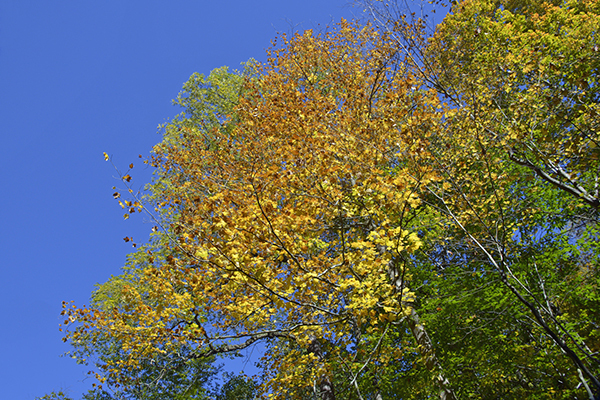 Elm leaves are dark green in the spring and summer and turn yellow to orange in the fall. Flowers: The flowers of most elms are largely inconspicuous as they appear in small clusters early in the spring. The individual flowers are quite small, and they appear white or purple in color. Fruit: The fruit produced by elm trees are seeds that are contained within a winged samara, commonly known as helicopters. Samaras glide through the air with their paper-like wings before settling on the ground. 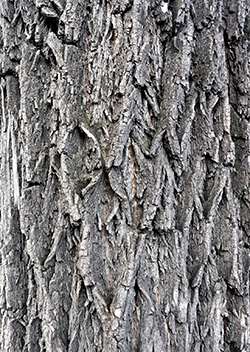 Bark: Elm tree bark tends to be dark gray in color with will defined ridges. Some species have deeper ridges in their bark than others. There are around 30 species of elm trees (Ulmus sp.) worldwide and six of these species are native to the U.S. Because native elm trees are either highly susceptible to Dutch elm disease or the elm leaf beetle, there are many cultivars and hybrids that are much more resistant to these problems. In this section, we will cover the six native U.S. elm species as well as some Dutch elm disease resistant hybrids. American Elm: The American Elm (Ulmus americana), also known as the white elm or water elm, is one of the most common elm species. They were once found all over the Chicago area until Dutch elm disease ran its course. These trees are tall with an expansive canopy and they are very resilient when it comes to harsh weather. 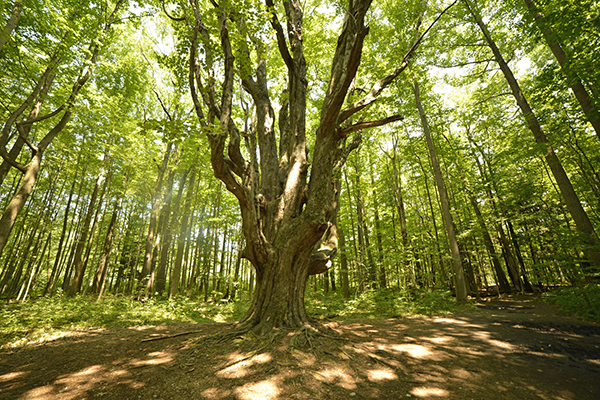 These trees can live for hundreds of years if they can avoid Dutch elm disease. Winged Elm: The winged elm (Ulmus alata) is a smaller elm tree found in the southeastern and south-central U.S. This elm is also resilient in harsh soil conditions, but it is less tolerant of shade than other elms. Winged elms are considered a nuisance species because they can quickly take over fields and forest clearings and they are susceptible to Dutch elm disease. This elm gets its name from the thin cork wings that form on its small branches. Texas Cedar Elm: The Texas cedar elm (Ulmus crassifolia) is a tall elm tree that grows in flat areas of the southern U.S. This tree is not as susceptible to Dutch elm disease, but it can still experience damage from this disease, and it is highly susceptible to mistletoe, which is a parasite that attacks the tree’s vascular system. Rock Elm: The rock elm (Ulmus thomasii), or cork elm, is found in the Midwest, including the Chicago area. These trees are very tall and can live for several hundred years if it can avoid Dutch elm disease, to which it is highly susceptible. Rock elm has the hardest, heaviest wood of all elm trees and it is sometimes referred to as a cork elm because older branches eventually develop cork wings. Slippery Elm: The slippery elm (Ulmus rubra) is found throughout the eastern half of the United states from Canada to northern Florida and the Great Plains states to the east coast. It is also known by several other names including the Indian elm, gray elm, red elm, moose elm, and soft elm. This elm looks a lot like an American elm, but it can be distinguished by its reddish leaves, buds, and fruit, as well as the inner reddish bark that is also slimy. September Elm: The September elm (Ulmus serotina) is found mostly within Tennessee and sporadically throughout the surrounding states including Illinois. These trees are not as tall as other elms and they grow near streams and limestone bluffs. The September elm is also susceptible to Dutch elm disease. ACCOLADE Elm: The ACCOLADE elm is a hybrid elm tree developed by the Morton Arboretum in Lisle, IL. It looks very much like an American elm and it is very resistant to Dutch elm disease and the elm leaf beetle. Patriot Elm: The patriot elm is a fast-growing hybrid that can resist Dutch elm disease, elm leaf beetles, and elm yellows. Frontier Elm: The frontier elm is another hybrid that is not quite as tall as other elms. It is very resistant to Dutch elm disease and the elm leaf beetle to a lesser extent, and its leaves turn reddish purple in the fall. As we have already discussed, the biggest threats to elm trees are Dutch elm disease and the elm leaf beetle which are both responsible for wiping out a large chunk of the elm tree population. If there are elm trees on your property, it is very important to be familiar with the signs of common tree insect infestations and diseases. Dutch Elm Disease: Dutch elm disease is one of the biggest threats to elm trees. This disease which was accidentally introduced in the U.S. is caused by a fungus and it is typically spread by bark beetles. Trees that are affected experience yellowing and withering of the upper branches and leaves early in the season and it spreads through the rest of the tree, eventually killing the roots. Dutch elm disease is so devastating that trees affected are often removed to keep its spread contained. Elm Yellows: Elm yellows, also known as Phloem necrosis, is caused by bacterial parasites known as Phytoplasmas. These parasites are carried from tree to tree by beetles and other bugs that feed on elm tree leaves. Affected trees will experience yellowing of the foliage immediately and the disease can progress to kill the roots within one year. Elm yellows causes the inner bark to turn yellowish in color and the bark will smell like wintergreen. Infected elm trees typically must be removed. Verticillium Wilt: Verticillium wilt is a fungal disease that starts at the root system and works its way up the tree. The branches and leaves will wilt and become discolored and eventually die off. It is very important to act fast with verticillium wilt because it can quickly kill trees. Elm Leaf Beetle: The elm leaf beetle is an insect that feeds on the foliage of elm trees and lays its eggs under the leaves. Adult elm leaf beetles are yellow with black stripes running down each side of its body and its larvae are black with segmented bodies. The adult begins affecting elm trees in late spring when they emerge from overwintering and feed on the leaves, leaving circular holes in the foliage. The larvae hatch earlier in the summer and also immediately begin feeding on the leaves, resulting in skeletonization. The larvae then find protected areas lower in the trunk and bark of the tree where they pupate and emerge as adults1-2 weeks later. Infestations of the elm leaf beetle result in defoliation, but this rarely leads to the death of the tree. Elm Bark Beetles: These beetles are primarily responsible for spreading Dutch elm disease between trees and they also damage the bark of the tree. Elm bark beetles are dark reddish brown in color. The females create egg chambers in the bark that look like circular, radiating grooves and when the larvae become adults, they migrate to a different elm tree to feed on the twigs. This is typically how they spread Dutch elm disease. When the adults are done feeding, they go back to a dead or dying elm to lay eggs. As long as these beetles don’t infect an elm with Dutch elm disease, the tree can be saved. Elm Borers: Elm borers are beetles that can cause damage to elm trees as larvae and as adults. The adults have skinny bodies that are black with oranges stripes and they emerge in the spring to feed on twigs and leaves and deposit their eggs. The eggs are laid in the bark of the tree and when they hatch, the larvae feed on the outer layer of bark and make their way deeper into the wood. They overwinter and pupate in the sap wood and emerge as adults in the spring. Affected trees will have light colored foliage and dead branches as well as week bark that can be pulled from the tree. The galleries created by the burrowing larvae can be seen under the bark. Most species of elm trees are very hardy trees that can withstand harsh weather and soil conditions. However, because most elm species in the U.S. are susceptible to Dutch elm disease, it is best to provide good care for elm trees on your property to help them better resist this disease. The following tips will help you care for your elm trees. Planting: New elm trees can be planted just about anywhere as they will tolerate most soil conditions and urban environments. They just need full sun or partial shade. When you plant a new elm, you do not need to add anything to the soil, but it does help to add some compost if the soil is poor. It is best to plant these trees in the spring or fall and they do not need to be fertilized until the following spring. Remember to only plant disease resistant hybrid elms, species like the American elm are not recommended. Watering: New elm trees should be watered weekly if there is not enough rain. To water the tree effectively, put a hose a couple inches underground and run the water slowly so it gets to the root system. Established elms should only be watered if there is a drought. When watering established elms, make sure you water the ground out to the edge of the canopy, elms have extensive root systems. Mulching: Spread a 2-3 inch later of mulch around elm trees to help retain moisture. You should lay down mulch immediately after planting a new elm. 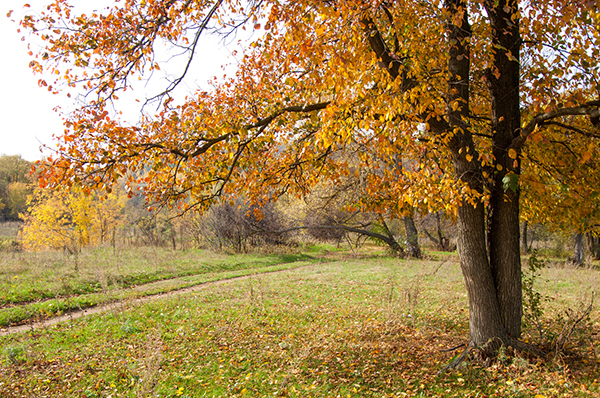 Fertilization: Elm trees should be fertilized at least once per year, but it is important to use the right amount of the right type of fertilizer. Using the wrong type of fertilizer or overfertilizing the tree can cause harm and increase its chances of Dutch elm disease. If you are unsure about fertilizing your elm trees, you can have a professional do it. Pruning: Pruning elm trees early in the spring can help protect it from Dutch elm disease. Dead or dying branches should be removed as early in the season as possible because the wounds attract the elm bark beetle that spreads Dutch elm disease. Early spring pruning will ensure that affected branches are removed and that the tree will have enough time for the wounds to heal before the growing season. Professional arborists can effectively prune elm trees to help them better resist disease and insects. Even though the elm population has been largely affected by the spread of Dutch elm disease, their resiliency has allowed them to keep their presence throughout the Chicago area. Elm trees will continue to stand tall and withstand the harsh urban areas and Illinois winters, but they need some help to resist Dutch elm disease and harmful insects. At Hendricksen Tree Care, our arborists are ready to provide care for elm trees on residential and commercial properties throughout the Chicago area. We can effectively diagnose issues with your elm trees such as infestations or the signs of Dutch elm disease and get your trees back to health with our tree treatment and maintenance services. We also provide highly effective tree maintenance, fertilization, and tree trimming services to give your elms a better chance of resisting disease. Hendricksen Tree Care proudly serves the north and northwest Chicago suburbs including Arlington Heights, Mount Prospect, Northbrook, Barrington, Lake Zurich, Glenview, Park Ridge, and Wilmette, IL. Check our blog for the next installment of our series about native trees of the Chicago area.